The important information you have won’t help employees flourish in their jobs if they don’t take it to heart. Studies consistently peg retention of what a person reads or hears at 10-20%. Adding something visual to the mix — photos, movie clips, live demonstrations — will increase retention to 65%. Get your audience actively participating in discussions or physically doing something, and retention shoots through the roof. You can help people ingest your training, and even (dare I say it?) look forward to it like the students in clip from “Better Off Dead”. This is the easiest way to help information sink in — let your class break into pairs or trios and talk about your topic, their personal experience or how they’ve witnessed the topic play out in the real world. The beauty of group discussion is there’s no prep on your part and retention increases exponentially (unless you let them discuss too long or range too far off topic). A short news clip of an employee or company dealing with your topic (in either the positive or negative) will make your words hit closer to home as they witness someone living through it. These go one step beyond news stories by using Hollywood’s best and brightest to reinforce your point. Use clips you’ve seen from film and television that illustrate your teaching point, or show your team one of the clips I post every Movie Clip Monday. You can always add photos to your deck, but why not take it up a notch by creating memes? These bold, often hilariously captioned photos filling up your social media feed are surprisingly easy to make. 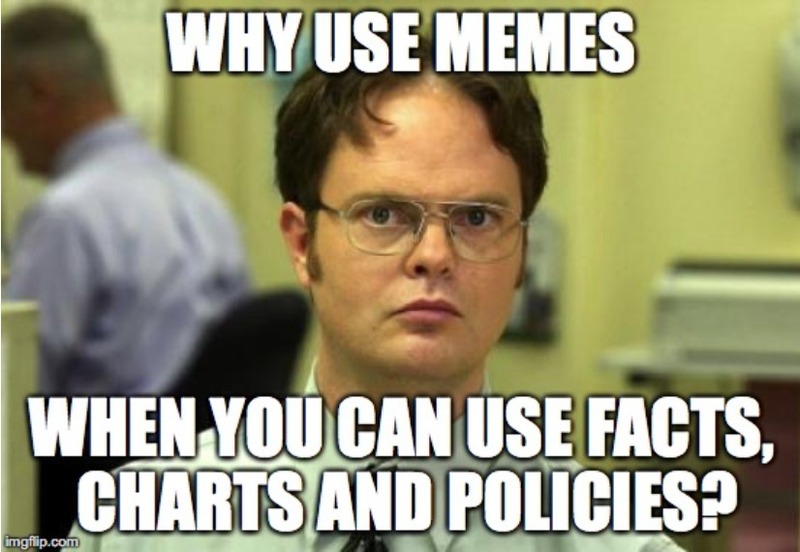 (Visit imgflip.com) I also provide free compliance related memes every Friday on our blog. No, don’t circle everyone up at your feet while you read “The Little Engine That Could.” Telling true stories that illustrate a compliance point, especially from your own life, will bring your discussion to life. Better yet, open up the floor for others to share real stories they believe highlights your topic. No matter which method you use, it’s important to get your class interacting with your material and each other. When you help them intellectually, emotionally or physically connect with what you’re teaching, you increase the likelihood that they will remember and act upon the important information you’re imparting in the future. And if they unexpectedly have fun in the process, all the better.